Read about dogs, dog training, useful information for pet dog owners, stories from my puppy classes, training sessions, and activity classes. Check concrete, pavers, tar seal, and sand at the beach with your palm first before walking your dog on it. Dog paws are sensitive and can burn easily. In addition, the heat radiating from the ground can affect dogs, especially short-legged ones. Early morning walks are best or late evening on grass. Be especially heat-aware if you have a short-nosed dog such as a pug or bulldog – they cannot cool themselves by panting as efficiently as their long-nosed cousins and are more prone to heat stroke than the average dog. Take along plenty of water. Don’t allow your dog to gulp, as this may cause vomiting. Frequent small drinks are better. Use a tip-proof drinking bowl in the car. Consider accessories to help your dog stay cool such as a cooling collar, bandanna, or vest or coat. Provide your dog a shady place to rest after exercising. Don’t shave long or double-coated dogs - their fur actually serves as insulation against the heat. Brush your dog to remove the results of winter shedding and improve air circulation. Don’t completely wet double-coated dogs – the water trapped in the fur heats up and increases body temperature even more. Apply sunscreen to exposed skin. Particularly susceptible are dogs with short hair, pink noses, or fur loss due to illness, hormonal fluctuations or allergy. The lightly furred area on the belly is also very vulnerable. Dogs can get sunburn and even skin cancer too! Know the warning signs - Symptoms of overheating in dogs include excessive panting or difficulty breathing, increased heart and respiratory rate, drooling, mild weakness, stupor or even collapse. They can also include seizures, bloody diarrhea and vomit along with an elevated body temperature of over 104 degrees. If in doubt - see your vet immediately! 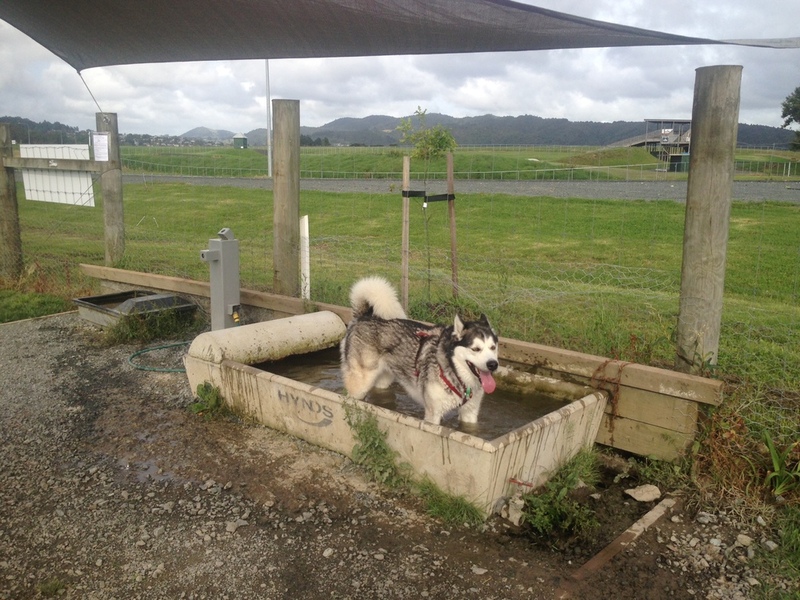 Moko is cooling off after a run. What’s up with the clicker?